I took this on my way to photograph eagles in the Wabasha area of Minnesota along the Mississippi River. This is Lake Pepin which is a part of the river. There was heavy fog that morning which sort of blended in with the ice ripples on the lake. What I like about this image is the mix of detail and soft elements. 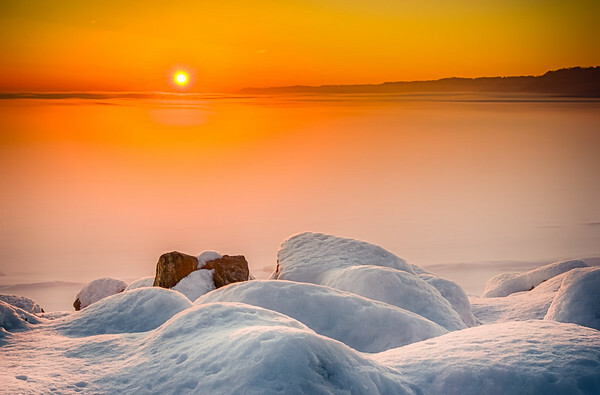 The sunset, fog and ice ripples in the distance are quite soft which is a nice contrast versus the detail in the rocks and snow. This image had a natural balance between the two but you can also add or subtract these detailed or soft areas by using the adjustment brush in Lightroom 4. The clarity slider works wonders in this regard and I prefer that over the sharpness control. One last thing to consider is making the snow pop. I adjust the color temperature in the foreground to make the snow pure white. I did this by using the graduated filter in Lightroom 4 then adjusting the color temperature. It depends on the color temperature of the snow to begin with so just move the slider left or right till it appears pure white.